I just received my latest fix from Stitch Fix and I'm giddy with excitement. Jenni, my personal stylist, totally rocked it this month. 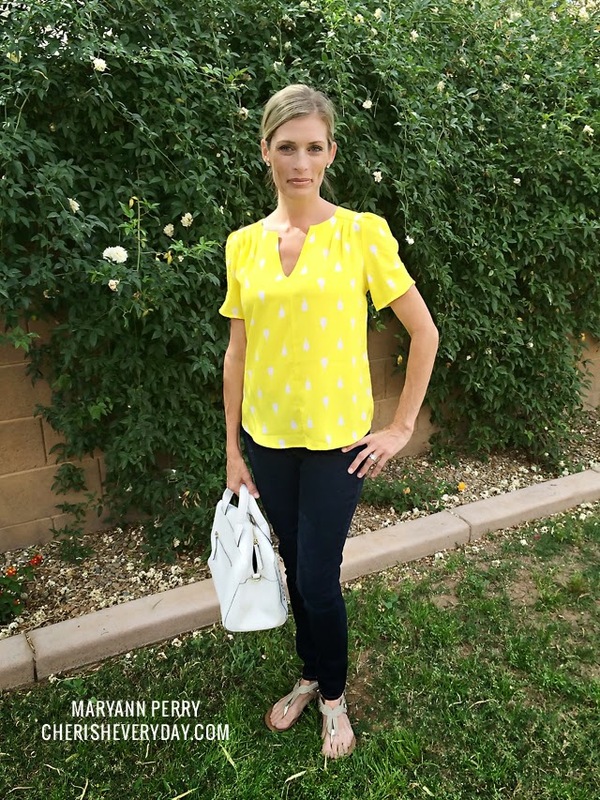 I can't wait to share with you Stitch Fix Friday: April Edition. I'll show you what I got in the box and kept this time, but I also wanted to answer a few questions I'm often asked about Stitch Fix each month. The first piece: Cai Boyfriend Short, from the Kut the Kloth. Super cute and something I wouldn't have chosen for myself. Unfortunately they were a little large... like my girls could pull them off... so they have to be returned. The second piece: Brentwood Laser Cut Satchel by Emperia. The white satchel handbag... I'm undecided on this one.... what do you think? 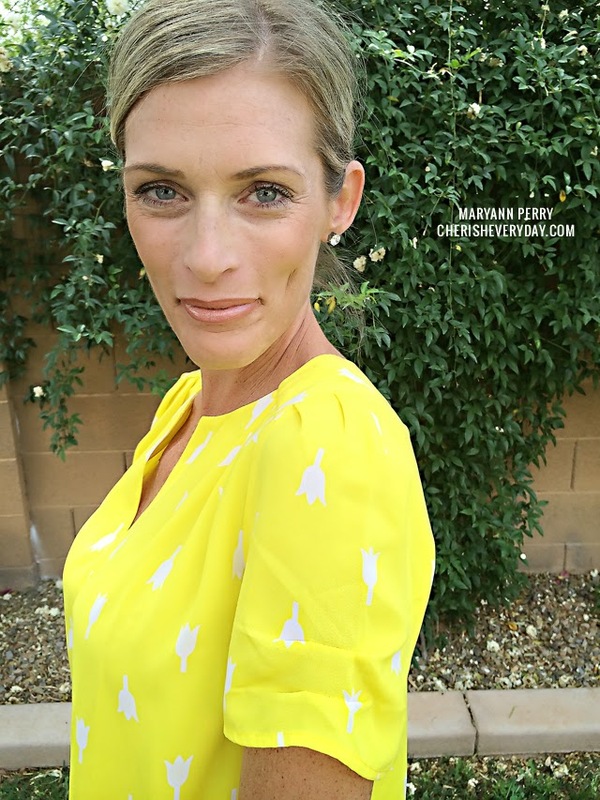 The third piece: Calloway Boat Neck Sleeveless Top by Tart, I love the color of this shirt and I really liked the fact that it had a built in shelf bra, however when I tried it on you could see everything.... and I had undergarments on underneath...... trust me.... I am sucking it in... in this picture, like not taking a breath. So while I really like the shirt... it has to go back. The fourth piece: Cathleen Tulip Print Short Sleeve Blouse by 41 Hawthorn, this shirt is a cheerful, sunshine-y shade that I adore! It is bright and perfect for spring. The blouse has pleating detail on the front and the sleaves and I love it. I'm keeping it!!! The fifth and final piece: Inna Striped Racerback Maxi Dress by Honey Punch. This dress is soft and flows.... it is STUNNING!!! The pictures do not do it justice. I am in LOVE with this dress!!!! It can be dressed up for a wedding or dressed down for a casual event. This is my favorite piece and I'm defintely keeping it!!! Stitch Fix is an online personal styling service. New customers begin their experience on Stitch Fix by completing an online style profile. The survey takes about 10 minutes. Simply provide information about your sense of style, sizes, spending preferences and clothing needs. It's fun, quick, and easy! Once you complete your profile, you are ready for your first fix! A personal stylist hand-selects five pieces of clothing and accessories based on your preferences, then ships them direct to your door. I love this service because I don't have time to shop and I can try on all of the garments in the comfort of my home. Once your fix arrives, you have 3 days to keep the items you like and ship back the items that don't work. Returns are free as well. You will be charged a $20 styling fee each time you arrange for a fix, but if you decide to keep any of the items in your fix, the $20 fee is as applied as a credit. And if you decide to keep all 5 items you get to save 25% on the entire fix. After you decide which items to keep, log in to your account and complete a final survey to let the company and your stylist know which items you wish to keep or return, and share any comments you have on each piece. Your stylist will use that information as they select the items for your future fixes. Referrals. When you get Stitch Fix, you can share it with all your friends. For every person you refer, you get $25 credit. So share it with four friends and your already at $100 credit. I would love for you to use my referral code, but no pressure! I hope this post inspires you to use your referral code!!! Ohhh I love the things you chose to keep, pity the shorts weren't the right size & I also love the teal? Not sure about the bag. The maxi looks awesome wish they did stitch fix in Australia ! Loving the yellow blouse/bag and the maxi skirt! You look amazing, MaryAnn :) Miss you, dear! That maxi dress is EXACTLY what I have been looking for. Desperately wanting a nice black and white maxi dress. Now why can't I find something like that in Australia? I love seeing all the stitch fix things, wish we had something like it here - though I'm sure I couldn't afford it even if we did.